A major focus for Apple in building iOS 9 is making it even easier to access the information you need, in part by predicting what you want before you unlock your phone. One way the upcoming operating system does that is by knowing when you get into your car, and predicting where you're probably planning to drive. iOS previously offered just estimated travel times in the Notification Center's Today view. But upon upgrading to iOS 9, users will find that travel directions will become even more convenient, with popular destinations automatically showing up on the iPhone's lock screen. Reddit user "MrMacNeil" first noticed that after getting into their car after work, directions home appeared on their iPhone's lock screen. Other users also commented to confirm that the functionality works on their Apple Watch as well. With iOS 9, the iPhone knows when a user gets in their car because of a connection to the vehicle's infotainment system, either via Bluetooth or USB. Making its mobile operating system more proactive has been a major focus for Apple in iOS 9. Most notably, the search function gains a new feature dubbed Siri Suggestions, which can suggest frequently used apps, nearby businesses, contacts, news topics and more. 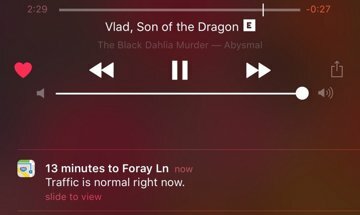 As iOS learns a user's habits, Siri Suggestions evolve and present information that it thinks the person might want quick access to. This is akin to the Google Now service, but Apple has placed an emphasis on protecting personal data, and anonymizing any information that might be sent through the Internet, to differentiate its service from its rival.